PhUSE, the biggest membership driven community of Clinical Data Scientists, supports Alex Flynn, a previous keynote speaker of their annual conference, to particpate in the Great Pacific Race. Alex Flynn is an adventurer with Parkinson’s disease, preparing to take part in an exciting new challenge. 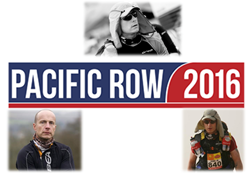 Along with firefighter, Darren Taylor, he will be competing in the Great Pacific Race this June. With a distance of 2,700 nautical miles from California to Hawaii, his aim is to win the race, and break the current record of 45 days, in the fastest time. Last October, Alex was one of the keynote speakers at the PhUSE Annual Conference in Vienna, Austria. He gave an inspirational talk on his desire to raise funding for charity, as well as his own personal experience in coping with Parkinson’s and how he hopes to inspire other people with neurological conditions. As Clinical Data Scientists, PhUSE members work with patient’s data, day in and day out and understanding those patient needs is what sets them apart from programmers and analysts in other industries. PhUSE wholeheartedly supports Alex in his venture and has set up a ‘Just Giving’ page, to help him towards his overall goal of raising £50.000 for this challenge and overall £1million for Parkinson’s and other neurological disease charities.